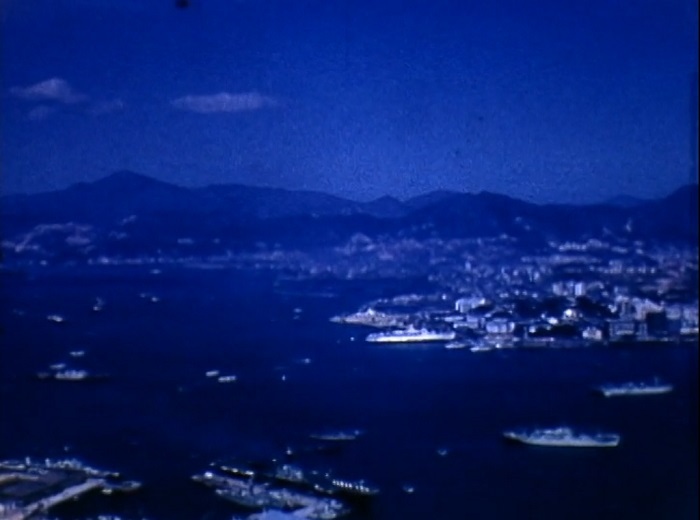 Still image from Orient Adventure: Hong Kong. "Hansen travels to Hong Kong following his original visit to China in 1937. Initially, he spends much of his time roaming the commercial districts, giving a sense of tourism side of Hong Kong. Immediately following, he spends several minutes focusing on the skyline and captures footage of locations on the outskirts of the city. Hansen then spends the rest of the evening eating at a local cuisine and attending a show. For the remainder of his trip, Hansen shifts his attention from Hong Kong's tourist areas to the residential districts, fishing docks, and rural farming." UC San Diego Library.